Joe Wittrock doesn’t want to buy Walker Manufacturing. But he still has something in common with businessman Victor Kiam who once said he liked his Remington razor so much that he bought the company. That he has done very well. In three short years, his passion for the mower has translated into some very healthy sales numbers. With wife Jodi, he opened shop in 2009, and now sells roughly 30 Walker Mowers a year. The Walker Mower, his biggest seller, is complemented by Husqvarna and Toro mowers and Echo hand-held equipment. Joe emphasizes his best sales tool is his own story. 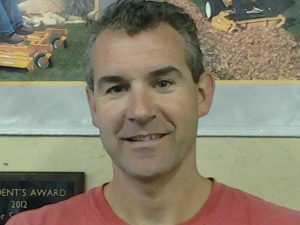 He started mowing lawns 14 years ago and grew Wittrock Lawn Service into one of the largest and most respected full-service landscape management companies in the area. In addition to more than 200 mowing customers, he has 400 to 500 lawn care customers, more than a 100 snow removal accounts, and an equal number of property owners who want landscapes installed, shrubs trimmed, and lawns power raked and aerated. He operates with two three-person mowing crews, one landscaping crew, and a fertilizer/pesticide applicator. From that initial 26-hp GHS mower, his crews now run with five Walker Mowers: three 26-hp units with 48-inch GHS decks and power dumps, another 26-hp unit with a 56-inch side-discharge deck, and a Super B equipped with a 60-inch deck. Crews have also used the MB, which has become one of the store’s best sellers. “I know these mowers inside and out,” Joe adds. “I know how the MB’s horsepower gives it the ability to easily operate larger decks, and nothing compares to how it handles hills. I also know first-hand how important that floating deck is. A year after hanging their shingle, Joe and Jodi moved to a premier location on Highway 71, the main street through Milford. The new location features a large showroom, enough space for thousands of parts and an ample shop for 2-3 service technicians. The Wittocks have three daughters, ages seven to 19. The oldest attends college in Wisconsin while the others keep the parents busy attending sporting events. In the meantime, she claims that her husband is obsessed with Walker Mowers. “He can’t read enough about them and loves operating and selling them,” Jodi says. Joe likely wouldn’t call it an obsession, but freely admits that the mower caught his attention as both a landscape contractor and dealer. He notes, too, that having the opportunity to actually use different mower brands gives him an added appreciation for his best seller. With a county population of only 16,000, Cutting Edge’s market is relatively small, yet its sales numbers rival many dealers in larger metropolitan areas. 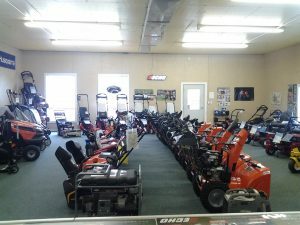 Certainly, familiarity with the mower, a great location, and being in close proximity to a vacation area has been instrumental to the store’s success. So, too, has the Clay County Fair, which Joe says is one of the largest in the country. As Joe points out, if you want good customers, you need to sell great products. But you also have to provide excellent service. 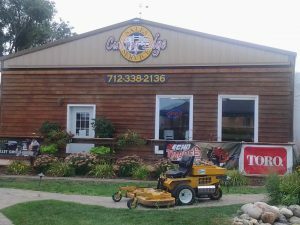 What bigger testimonial to the store’s overall success than his ability to sell not to just any customers, but many of whom are among his biggest lawn maintenance competitors.